John Adams, who has served as President of the Steering Committee, has announced that he is resigning effective immediately. Doing this work is often a thankless and grueling task, and even though there have been strong disagreements among the Committee, everyone in our community owes John a debt of gratitude for the time, effort and dedication he has given to this task. I am a home owner on the the 11th fairway. I have also practiced law for 55 years; 40 + years as a trial lawyer. It is my opinion that it is always advantages to meet and confer with opposing sides inorder to determine if there is any common ground or ways to resolve issues. Appoint one person to do the talking if the developers observe that we are factionalized, they will take advantage of it. With that stated, I do vigorously oppose the building of residential units on the golf course. State you are present to determine if the matter can be resolved without committing to any concessions. If they offer to make any concession, then state you need to take it back to the homeowners before making any commitment. Mr. Kahn, III – Thank you for your most insightful and thoughtful comments about the current situation we are facing with respect to attempting to meet with Mr. Richards. I would like your permission to quote you at the next Steering Committee meeting. I too oppose the building of even a dog house on the golf course. It is our belief that the battle over zoning will be fought at the ballot box since that is the only way Mr. Richards can effect the necessary changes he will need to simply start the process of getting anything built. Thank you, John, for your contributions! It then begs a question: How will this organization and the Steering Committee select a new president? In response to Mr. Gollas comment, the Steering Committee will meet Thursday March 2 to select officers to replace those who have resigned or moved on recently. I will temporarily chair the meeting like I did for the initial meeting last November. There might be other items brought to the committee but I can assure you we will NOT be setting a meeting with Mr. Richards. We got out heads handed to us pretty good this past week so it is time to regroup. A full report will be posted on the web site. Thanks, David. I’m glad the committee is heeding the community’s wishes. It would be helpful if there could be clarity around what the Steering Committee’s role is. I think a lot of us had been left with the impression that officers/a steering committee were needed just so Stay the Course could become an LLC and raise money to help protect the golf course. Having a clear definition for the public would be helpful, along with keeping everyone apprised in advance of upcoming meetings by sharing the agendas, and posting meeting minutes after the fact. I also suggest that anyone on the committee who has had contact with Richards via phone, email or personal conversation should step down, and should he reach out to anyone on the committee again, you should not respond. Also, if there are important decisions to make in the future, please hold a broader community meeting. I would also suggest that the new president NOT be someone who wanted to meet with Richards, as it could be difficult for the community to trust in that person’s leadership. All of these steps are crucial in ensuring our community remains united, and in ensuring that community members will feel comfortable donating to this LLC one day. 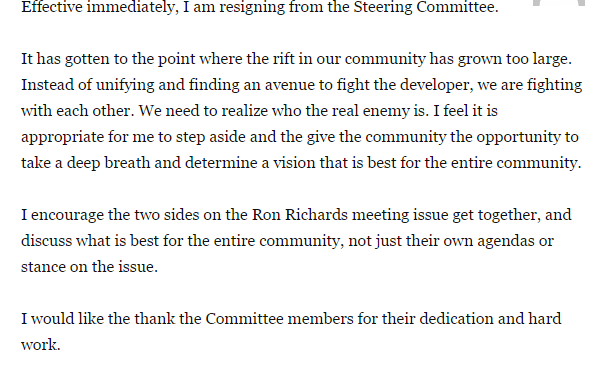 Again, thank you for having listened to the community and for deciding against meeting with Richards. If Ron wants to meet with someone to discuss his wishes, he can contact our elected city council, not a steering committee. Nobody on the “committee” should be in contact with Ron. He has zero leverage and zero interest in the well being of our community. There is nothing to discuss. Why would you even think to entertain a conversation with him. Makes no sense. We already know what he wants but he can’t have it. SRGC has never been zoned residential. It was zoned “golf course only” in 2006 and “golf course” in the 2035 General Plan. This makes SRGC more immune to residential development than the owner’s other golf courses. The HOA’s litigations, owner’s course destructions, and developments on these other courses are being used to scare us. As reported, the owner could put the rezoning on the ballot with a petition, but so can STC with an open-space appeal. Like the owner, STC would need about 9000 signatures and the legal structure to run a campaign. I don’t think that the owner could win when all costs are known. “Appeasing” a ruthless, adept litigator with a rezoning settlement is a bad plan; thus, STC should stay out of it. Let the City’s formal processes take place as the fight is about City sovereignty and is the City’s fight. I’m told that the City has a winning hand, i.e., if it just stands firm with its current zoning. It is unfortunate that getting together to clear up numerous false narratives and beliefs is being thwarted by a vocal minority. The meeting was intended to clear up any false misconceptions between myself, my company, and the community. All were invited to ask questions and get truthful answers. I find this strategy of avoiding a dialog poorly thought out. I settled a much more complicated matter with the homeowners in Rancho Mirage and mostly everyone is very excited and pleased with the result. Since talking to myself is not productive, hopefully these voices of no engagement will realize that dialog creates solutions. If the court or political system took these type of positions, nothing would ever get accomplished. Hopefully this view can be reconsidered in the short run. Go speak with our city council if you have thoughts or questions. I believe that should read “vocal majority”. Submit your proposal to the city council and start the process. The challenge is that you are a skilled attorney that would be talking with a small group of no attorneys who have no authority to do anything. Also, they would then relay whatever was discussed which means all of the residents to don’t get to hear directly from you and you from us. My suggestion is for an open meeting that any resident can attend to hear directly from you and allow for questions. While I prefer to not see development of any kind, I do want to work with you to come to something we all can life with and the first step should be all of us hearing directly from you what you would like to do. This ensures nothing is missed in translation. Please consider setting a meeting that all can attend so we can all hear directly from you and you from us. Hi, Kirk. Our city has a formal process in place so that if the owner of the golf course wants to request rezoning of the land so it can develop it, it would need to submit a proposal to our city’s Planning Commission. As part of that process, there would be public hearings open to the entire community. If the Planning Commission approved the proposal by a 4/5 vote, it would then go to our City Council, which would also hold public hearings open to the entire community. If anyone would like to know more about the owner’s plans, you will have every opportunity if the owner submits a request to the city. There should be no meetings set by the owner directly with the community, or with anyone in the community setting up a meeting directly with Ronald Richards or any other representative for the LLC. There is nothing to discuss. We don’t want any building of any kind on ANY of that land. There is nothing at all to discuss. First off, thank you John for stepping up to lead the committee, as well as your hard work and dedication. Definitely not an easy task. Emotionally charged situations such as these are hard to handle and I, as well as many, many others, breathed a sigh of relief that we had finally put together a steering committee of diverse talents and opinions that was committed to working together to “Proactively develop offensive plans of action to provide us leverage” * in our quest to protect our community. One of the larger reasons for even having a steering committee was to break away from the unproductive, extremely emotional large community meetings we were having. We were counting on them to help move us forward. Unfortunately, the Steering Committee has let us down. This is NOT about whether a meeting with Ron Richards is important or even beneficial so let’s take that out of the discussion. It is about respecting the process and one another. Our steering committee had a vote on meeting with Richards. The majority vote was yes. That information was “leaked out” to some friends by one of the disgruntled minority voters before details could be confirmed and posted properly on the blog causing (IMO intentional) drama resulting in a false narrative. Other minority voters either quit our started posting inappropriate comments on social media platforms that were not in support of the very committee that they were a part of. A resident survey was sent out without the Steering Committee vote or vetting. Why all of this? Because they didn’t get their way. They lost the vote. This is dishonorable behavior. A committee is by all intents and purposes a group of people working for a cause and not their own personal agendas. Why waste both the committee members and your communities time participating if you were going to jump ship and cause an emotional firestorm the second you didn’t get your way? We are losing the help and support of people uniquely qualified to help guide our community through this situation. I keep saying that as a community that we are better than this… can do better than this… But clearly we are not and cannot. Very well said Mary, thank you so much for your well thought out and accurate statement!! Couldn’t have been expressed any better!! Scott and John will be missed greatly by the committee! Thanks to both John and Scott!! Thanks John for leading the team and sorry to see one by one people resigning. I agree with Mr. Khan. I have always been opposed to meeting with the builders, however it would be nice to see what their intentions are with out any commitment. I live on the course and hate the idea of houses being built. I think we need to stand together and support the committee and let the committee know in no circumstances you can sign or commit to anything without a community vote. They should be at this meeting as our eye and ears and nothing more. But they have fenced all the opening. The golf course is empty so this is more suspicious and if we sit and do nothing we cannot find out what their motives are. Again San Ramon needs to stand united. Is there a way to have a townhall and get the developer here to answer the communities questions? Please don’t break up the community, stand together and thank the people who are giving their time to support us. Again for those who have seen my posts a year ago I was an opponent of any meeting. However living on the 18 hole and seeing all the back and forth activities at the golf course worries me. If that is so why aren’t you going to the city council and doing the right thing. Maybe if you worked through the city council this community would give you a chance and listen to you. This city has a city council and a planning commission take your case to them and then try to talk to this community. There is no mintory voice san ramon is a special city and has a strong community. While I am against any type of development within south San Ramon (Golf Course or otherwise), I am amazed at how everyone seems to elevate Ron Richards into some “Perry Mason” attorney. Check his record, it ain’t all that spectacular. Let’s stick with the City Council and Planning Commission to do their jobs and if it comes to a vote, so be it. I retire in 30 days, so I can be one of those guys walking the neighborhood to get signatures or whatever. If we stick together as a community, we are strong. Continued infighting will only result in a loss of a common voice. I agree let’s stick together. We are stronger than the other communities that these builders bought. Not to long after I saw the post it was removed from the blog along with several other posts he had made. Most of us were taught as children to face our issues and problems directly and not to ignore or run away from them. In turn we teach our children to do the same. Whether we acknowledge this issue or not the bottom line is it exists. Deleting or censoring someones post because we don’t like them or agree with them does not make the issue go away. I plan to attend the meeting and listen to what he has to say. We need to realize we do not own the golf course, yet we can have an impact and say on the future of the property. Whether we like it or not we have to accept the fact that Tree City LLC owns property in our neighborhood just as most of us do. achieve the best possible outcome for San Ramon, I encourage you to RSVP and attend. I’m really concerned that Scott Holder is promoting Mr. Richards’ agenda, through reposting/publicizing a meeting that Mr. Richards wants to orchestrate. Mr. Richards should be following the formal channels of submitting a development plan to our Planning Commission. Public hearings would then be held, enabling everyone in the community to participate. Clearly he thinks he has something to gain by meeting with the community (without a city attorney there) prior to that process. Please do not attend this meeting or publicize it for him. I, for one, believe in obtaining as much information as possible in making decisions on important issues. I refuse to rely on rumors and supposition that try to sway one’s opinions. And I certainly do not support the efforts of some who attempt to supress people’s ability to access information. You obviously don’t know Scott, as such I strongly urge you to refrain from attacking the man. Meeting with the owner as Scott and many others are in favor of to listen to him is not ‘compromising’ at any level. Again knowledge is power!! It’s time for people to open up their minds!! Why are you trying so hard to circumvent the city’s development process? Is there a reason why former Steering Committee members (who resigned after there was outrage because they scheduled a secret meeting without obtaining public input or informing San Ramon residents ahead of time), ARE NOT ONLY PUSHING for a meeting with Ronnie Richards, BUT ACTUALLY ACTIVELY ADVERTISING IT…DESPITE THE FACT THAT THE COMMUNITY SURVEY RESULTS HAVE NOT EVEN BEEN POSTED. The developer would not be trying to entice people to come…free drinks and snacks,really?…if he does not think the meeting will be of great benefit to him. I continue to urge San Ramon residents to send the firm message. GO TO OUR CITY AND SUBMIT A FORMAL PLAN! THEN, AND ONLY THEN, WILL THIS PUT TO REST ALL THE RUMORS ABOUT YOUR PROPOSED PLANS FOR THE GOLF COURSE! No one is being “censored” on the blog. Since this site’s launch ten months ago, posts from only two people have been moderated. One was from a user attacking another. The other was from Ronald Richards, who was using this site to promote his own agenda and meeting. Mr. Richards called me the morning after his posts had been moderated to complain that his “First Amendment rights” had been violated. Aside from the fact that Constitutionally guaranteed freedom of speech does not apply to a privately owned forum like this one, no one has an obligation to provide a platform for anyone to advance his own agenda. Although the idea of a smaller group, the Steering Committee, was approved by a significant number of residents at a public meeting, the individual members of the committee were not elected. We–including Scott and John–are just people who have volunteered to help in a common cause. Therefore, setting a highly controversial private (not “secret”) meeting between the developer and a small segment of the community was an action deserving of community input. As it turned out, the sentiment about a meeting with him was 2:1 against. I respectfully disagree with your statement that “[survey] results don’t matter.” It is a reflection of the opinion of the greater community–the same community that decided to have a smaller group to represent their wishes and interests. If the Steering Committee had proceeded with its meeting against the wishes of the community, it would have demolished any effect and credibility it had. Speaking for myself, I like and respect both Scott and John and appreciate the work they have put into this. While I personally disagree with some of their opinions, I will continue to defend them vigorously against any personal attacks. Enough! Let’s all start acting like adults here. I am so sick of reading about people in our community ripping each other to shreds, for what???? If you read about what Ronnie Richards has done in other communities this is EXACTLY what he does, it is his first step in his playbook. What is VERY CLEAR to me and the community at large is that there are 2 completely opposing camps here in San Ramon, One who is saying TO STAND BY OUR VOTER APPROVED GENERAL PLAN which states that the land is zoned golf course PERIOD (The let it go brown camp), and one OPEN to EXPLORING OTHER OPTIONS TO SAVE THE GOLF COURSE that they enjoy playing on. After discussing this situation with numerous people here in the community and elsewhere, I think it is CLEAR that this group needs to clearly break into two separate groups. EVERYONE is entitled to their opinions on this issue. It is clear that the two sides are so far apart that it does not make sense to come together at this point, it will never happen. The call for TRANSPARENCY was not uncalled for or wrong., it is what typical committees who represent a larger organization do. To those “in the know” you already had that. To those elsewhere in the community, transparency was expected and implied. IMO, the reason why so many feathers got ruffled was because people assumed they were backing a group with their beliefs. There was a strong camp AGAINST meeting with the owner from long before this happened and a strong camp FOR a meeting. These two things are such polar opposites that there is no bringing us together at this time. IMO, there should be 2 separate groups, one for PRESERVING our VOTER APPROVED GENERAL PLAN and ONE for SAVING THE GOLF COURSE. Each group needs to have CLEAR MISSION STATEMENTS so everyone knows which horse they are backing. I believe that once you step aside and come to the realization that we will not come together at this time, acceptance will come. In the spirit of transparency, I am in the camp of NOT MEETING because I strongly believe based on research on recent court cases by the California Supreme Court and how they view Voter Approved General plans, this will go to the voters in the end. Though I do understand and accept that others in the community may not share my beliefs. I am also under the belief after reading all the comments from our community about the approved building that the citizens of San Ramon are so sick of all the growth that this will never pass. In other words, we are going to need to come together at some point. Let’s stop the name calling, intimidation and accusations and act how we would want our children to act. I would also like to say THANK YOU to Joe Parsons who continues to be the one of the few calm voices throughout this heated debate. You continue to take the high road and I appreciate that. Hi Denise, the following are my personal opinions only, these may not represent the STC steering committee members or our fellow neighbors in the SRGC community. Such volatile posts and extremes they are not useful, please refrain. There is a complete misunderstanding of the issues expressed and promoting division amongst us where none is needed is not unifying or helpful to our cause. We are one community, and one in our strong resolve to prevent future development on the SRGC. Please do not ever forget that, regardless if you support going to this meeting or not. John and Scott and everyone else that has been involved to this point are highly respected in our community and we are unified in our goal regardless of minor differing opinions on the strategy of whether or not to attend this silly little meeting. We are united in our resolve to prevent development of the SRGC. The only issue here, and it is minor, is whether or not to attend a meeting. According to RR, opposition to attending the meeting is a vocal minority. Wrong-O. The survey says it is 2:1 and that’s a strong majority. The current steering committee members as a group, do not support attending the meeting with the new golf course owner, and will not, for a variety of reasons. Future meetings can be anticipated. If and when a defined proposal is presented to the City, then we will all participate in that process. Other property owners will attend this initial meeting to satisfy their curiosity and for their own reasons. You know, its not the end of the world either way. Go if you want, stay home if you want, this meeting will by itself determine the outcome. Don’t drink the cool-aid and keep focused on the goal. Division amongst us does not help our cause. We are one community and to the best of my knowledge, every person in the SRGC community has the very same objective and strong resolve, to prevent development of the SRGC properties.